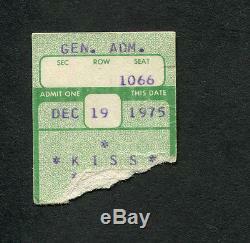 Original 1976 Kiss Concert ticket. December 19, 1975 - Broome County Veterans Memorial Arena, Binghamton, NY. Approximately 1 1/2 x 1 3/4 inches. Ticket has a small light bottom left corner crease. Our inventory consist mostly of one of a kind items that we do not have extras of, so when they are gone, they are gone! The item "Original 1975 Kiss & Rush concert ticket stub Binghamton NY Dressed To Kill" is in sale since Monday, December 21, 2015. This item is in the category "Entertainment Memorabilia\Music Memorabilia\Rock & Pop\Artists K\Kiss\Concert Memorabilia".